The Blue Snowball Microphone is definitely on the “cool” end of USB Microphones. 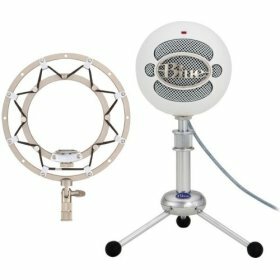 Blue Microphones have been making their “ball” type microphones for a number of years now and the “Snowball” is their latest USB offering. At first glance the Blue “Ball Microphones” look quite different, the mics themselves are about as big as a softball and varied in color; the Snowball is, as you would expect, white. In order to help with some of the thumps and bumps you might pickup while using them to record they offer the Blue “Ringer”, which is a suspension unit for the microphone that gives a “vintage” look and helps with picking up unwanted “knocks” with the microphone. 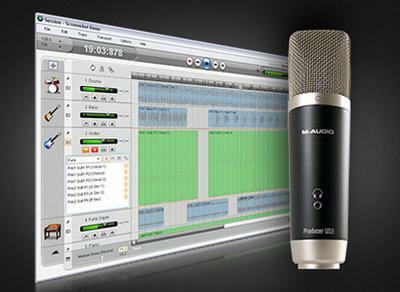 The big “hook” with the Snowball is that it is a USB, plug and play, condenser microphone. That is, you plug it into your comptuer and it works (no drivers needed). Another great option with the Snowball is the three-pattern switch which allows for changing the recording pattern from cardioid to omni, or cardioid with a -10dB pad applied (in order to accomplish this it has two capsules inside it) . True to it specs., it does pick up a pretty impressive degree of frequencies, 40 Hz to 18kHz. Why was I interested in getting my hands on this particular microphone? I already had a Blue Kickball microphone (which is KickBUTT! ), but I had not worked with a USB microphone up until this point and had read a lot about the shortcomings of the “first generation” USB microphones, especially with regard to latency issues. I was talking with Barbara Freedman, who has a great music technology site, over at http://musicedtech.wordpress.com/, about these issues and she said that she had a Snowball microphone and would gladly send it to me to look at and review. So thanks to Barbara and her generosity, I was able to acquire her Snowball microphone to “give it a whirl”. I tested the Snowball in a variety of audio computer environments (with a PC, using XP and Vista) including, Audacity, Adobe Audition 1.5 and 3.0, Goldwave, Skype, Krystal and the XP Sound environment. For whatever reason, I could not get the Snowball to work with Adobe Audition 1.5 (that being said, it did work with Adobe Audition 3.0 on Vista and XP with the ASIO4ALL drivers installed). At first brush, the sound quality of the microphone is very good, certainly on par with my Blue Kickball microphone (as you would expect…although it’s a powered dynamic) and for speaking, it sounds every bit as good as my Shure SM58 dynamic does when it’s connected to my computer. For recording purposes, the Snowball is limited to a digital input of 16-bit/44.1 kHz for, as the Snowball Manual puts it, “ease of use”. So for recording purposes, this amounts to a standard “Cd Quality” bit-rate/sampling rate input. A number of reviews I read when, reading about the Snowball microphone, stated that the controlling the volume with the Snowball was a problem because it lacked any control for setting the input levels, but the Snowball I tested had the latest “firmware” update and this was easily controlled via the PC sound mixer’s properties control panel and the use of the 10 dB pad on the microphone itself. When recording to Adobe Audtion 3.0, Audacity, Goldwave and Krystal, I had no problems getting the audio to the track. It was as simple as it states and sounded very clear and full. The microphone also works great for Skype. In all these instances it was literally, “plug, play and work”. The sound quality, as I stated earlier, was very good. For recording podcasts, this microphone would/does make setup and usage a breeze. The problem with using this particular microphone (or any USB microphone without a direct out) comes when you need to monitor the input for studio/vocal type work, etc. Because of the inherent disconnect between a USB source such as the Snowball and the audio interface in a computer, there is no good way to monitor the output of the microphone “live” without software that supports ASIO. This means that unless you are using software that supports ASIO drivers for your hardware there will be no acceptable way to get the Snowball to monitor (through the computer) within any acceptable framework (let’s say, generously, a latency of less than 30-40ms). If you are looking for an “on the cheap -Freeware” solution that supports the latest ASIO4ALL drivers, I would suggest the Krystal Audio Engine. I was able to get this freeware solution to work within an acceptable latency “monitoring” configuration with the Snowball ~25-38 ms. Using Adobe Audition 3.0, I was able to get the direct monitoring latency to less than 20 ms. Please note that trying to monitor the input of the Snowball Microphone through your computer by using Audacity’s “monitor input” function (or any non ASIO audio software) will result in a dismal delay due to the lack of ASIO driver support with Audacity ~>100 ms.
One final thought about the utility of buying a “single” USB microphone for all of your USB mic needs, is that we don’t have the flexibility to use all of the standard microphones that we’ve come to know and rely upon. That is, the selection of USB microphones is currently very limited at this time. A solution that I am going to HIGHLY recommend for any of you looking to buy a USB microphone is to not purchase a USB microphone, but rather purchase a high quality USB mic preamp such as the Centrance MicPortPro. 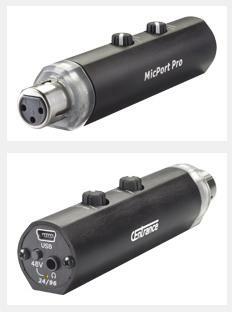 The Centrance MicPortPro costs around $150.00 U.S. and offers full 24bit/96kHZ broadcast quality audio output, features 0 latency monitoring (due to the direct output, not unlike the MAudio solution), allows for 48v phantom power usage, and provides volume controls for both the mic input and direct out monitoring – all built into the device! MOST importantly, it works with any of the microphones that we already own, are comfortable with…and love. In the end the choice is yours, the Snowball (or any other USB mic) is a great microphone for what Blue states that it is. If you are looking for an easy to use, easy setup solution, for podcasts, Skype, or other simple audio solutions, they may very well be a good purchase for you. BUT…make sure you consider what you are trying to do with the microphones before you go out spending a hundred plus dollars on something that may not be used EXACTLY the way you are thinking about utilizing them!